Proven to stand the test of time, the 2017 Honda CR-V remains one of the most popular of Honda's vehicles and a favorite of SUV lovers far-and-wide. With its spacious interior and attention-grabbing exterior, this vehicle has been a family-favorite for a while. Now, in the 2017 model, Honda has only improved this versatile vehicle. Here are some of the features that set this year's CR-V apart from all the others. Starting under the hood, we see that the 2017 CR-V has a formidable 185 horsepower engine. This provides just enough oomph for beating that early-morning traffic to get to work on time or making sure you aren't late to that regional soccer game. The 2016 model was rated for *26 city/ 32 highway mpg. It also features a readily available real-time all-wheel drive option which will automatically kick in with loss of traction. Some of the other features include a power tailgate option which allows the tailgate to open and close all at the touch of a button. The side mirrors have an integrated turn indicator function to notify other drivers when changing lanes or turning. This helps prevent confusion, and therefore accidents, when on the road. When looking to start this powerhouse, some models come with a handy push-button start option where key insertion is not necessary. On the inside, carefully-crafted leather trim is available as well as a one-touch moon-roof for late-night star-gazing. The higher models include a 10-way seat adjuster to perfectly match your comfort-level and even a 2-seat memory option for you and perhaps a spouse or other family member. The center console is roomy and provides all the hook-ups anyone would need for smartphones or other devices. On the safety side, the 2017 CR-V excels as well. With Lane Keeping Assist to ensure the driver remains in their lane and even a function to automatically stop collisions altogether, this vehicle is a must-have for families looking for the top in safety engineering. It will even warn you ahead of time with a Forward Collision Warning feature that alerts you when closely approaching another vehicle. The 2016 CR-V was rated a **5-star overall safety rating. 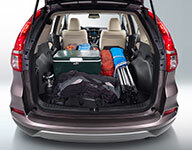 At the highest end of Honda's CR-V line, the Touring model includes a power tailgate, automatic projector halogen headlights and Honda Satellite Navigation System . With features from sturdy 18-inch alloy wheels for greater smoothness and stability on the road to heated and powered side-mirrors, the Touring is the quintessential SUV. Unlock car doors without ever having to fish for your keys. The entertainment hub you've always wished for with music, podcasts, and more interactive media. 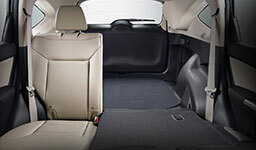 With a whopping 37.2 cubic feet of space to begin with, increase this to 70.9 cubic feet when folding down the second-row seats. Now you can transport that awkwardly long object while still saving room for a rear-seat passenger with this space-saving feature. With all these and more amazing features in mind, it's no wonder the CR-V has been such a hit among consumers. It serves as a trendy sport vehicle with its high-end performance and powerful engine as well as a safe family vehicle with practical safety and cargo features. This is a must-have for any price-conscious consumer looking for the most bang for their buck.